There is good news for the residents of New Castle who have been plagued with the problem of hair loss. It would now be possible for the citizens of this place to avail pre-mature balding treatment without having to go for expensive massages and spas. Our team of experts would ensure that every aspect is looked into thoroughly and the most suitable way is suggested so that people can get over this issue. Situated in the heart of the medical district in Newcastle, our contemporary clinic is the ideal environment to discuss your treatment needs. Free on site parking is available at the clinic and the area is also well served by local bus routes meaning we are easily accessible however you decide to travel. Hair loss is a common problem now-a-days and affects not just the scalp but sometimes the whole body as well. The medical term of this problem is Alopecia. There are numerous reasons for hair loss like heredity, medical conditions, hormonal changes, medications, etc. Anyone can have this syndrome at any point of time with male baldness being the most common type. It affects almost half of all men by the time they turn 50. It starts in the late teens and progresses when they are in the late thirties. Effect of heat and cosmetic chemicals. Stressful life – Androgens increase the secretion of hair loss chemicals called DHT. Oxidation occurs because of stress, which in turn affects the co-enzyme Q10 leading to quicker hair loss. Inadequate protein supply – A diet that is not rich in protein forces the body to divert the protein meant for proper hair growth. This, in turn, triggers hair loss to a great extent. Other factors like Vit B deficiency, chemotherapy and ageing also lead to hair loss. Tobacco is yet another factor that leads to this problem. No pain and no side effects. Hair transplant is a surgical process that involves moving the hair follicles from one part of the body (referred as donour site) to another (referred as recipient site). Nu is proud of the clinical expertise and client services that we offer. The clinic manager, Stephanie, has worked in the cosmetic industry for over 3 years and has extensive knowledge in hair loss procedures. 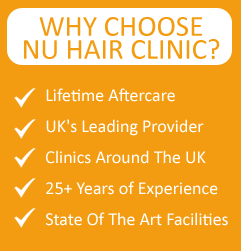 At Nu Hair Clinic Newcastle, you can access the best free consultations with expert surgeons to ensure you have all the information you require to make the decision that’s right for you. Nu Hair Clinic in New Castle is rapidly climbing the ladders of success because of its efficient team of professionals having sound technical knowledge about hair loss treatments as well as fantastic courtesy of handling customers. Our clinic here in New Castle caters to customers having various kinds of hair problems. By providing customized solutions to all sorts of hair related issues, we have gained high end customer satisfaction. The clinic manager Stephanie here has a strong knowledge base about hair loss treatments because of her extensive experience of 3 years in the Cosmetic industry. Hair transplant treatments for men and women in New Castle and the surrounding regions has now become a monopolistic job of our clinic. People trust us readily about the treatments because we are comfortably used to doing it several times with success. Our surgeons are the world’s best ones in the profession. They perform the surgeries so artistically that almost no signs of the surgeries are left back. We charge very reasonable fees for our services which is why we are swiftly getting more customer chains. We allow our patients to get a proper pre operative and post operative care so that the total process is executed in an unblemished manner. We have experts in the non-surgical treatments as well. The Mesotherapy and the Platelet rich Plasma Therapy are the two most demanded non-surgical hair treatments done in our clinic in new Castle. For hair thinning and baldness, the most important surgical treatment we provide is known as Follicular Unit Extraction (FUE). It is a surgical method of grafting fertile hair follicles from hairy regions of the scalp to the barren zones. For inadequate beard growth or lack of eyebrow hair, we also provide facial hair transplant and eyebrow restoration treatments. Our customers are highly satisfied with our services. Do you long for long lustrous shiny locks that can make any women jealous? Do you wish to have well groomed and polished hair that can make any men envious? Are you still day dreaming of making this day come true? Then make haste and go visit the Nu Hair Clinic in Newcastle for ravishing long locks and new hair growth. This contemporary clinic in Newcastle set in the perfect environment offers you the best of treatments for hair loss. Located in an easy accessible spot well commuted by bus routes and free on-site parking, this clinic offers the best of facilities and latest equipment’s to make your dream of best hair days come alive. How does the Treatments Work? Though many clients visit the clinic with varied problem related to hair, we take care that we provide customized remedies to all our patients based on their problem. Hair transplants for men and women are undertaken at the Nu Hair Clinic in Newcastle. The pre-operative and post-operative treatments offered for hair growth are some of the best in Newcastle. Mesotherapy and Platelet Rich Plasma therapy are the two non- surgical treatments for hair loss which are now in demand at Nu Hair Clinic in Newcastle. Follicular Unit Extraction (FUE) is yet another effective and successful surgical treatment adopted at the clinic for hair loss, hair thinning and baldness. In this treatment, hair follicles in the scalp are grafted from hairy area to bald area. Facial hair transplants and eyebrow restoration for those who lack hair in eyebrow, beard, moustache etc. are also performed at Nu Hair Clinic, Newcastle. To see visible results, it is vital that we take good care of our hair after the treatment. Exposing the treated hair to adverse weather conditions, not taking the medications on time and lack of proper diet can reverse the treatment. Hence, it is vital to pay proper attention to the doctor and follow their instructions wisely to have long, lustrous hair for a longer time. The surgeons and doctors at Nu Hair Clinic, Newcastle are some of the best experienced and well know doctors who are trained to do their job well with more experience in the industry. The patients are handled with utmost care and concern, so that they go through the treatment without any worry or fear and emerge seeing good results. The doctors are trained in their field and at most of the times, they do not leave back any traces of the treatment and the patient looks flawless after complete and new hair growth. The trust our patients and clients lay on our doctors makes our relationship stronger at Nu Hair Clinic. All our customers are highly satisfied with the service rendered at Nu Hair Clinic in Newcastle. Many come back with responses and suggestions saying, they are happy with the treatment of the doctors, their compatibility and the facilities and techniques used are most modern and very effective. They also say that they are very comfortable while at Nu Hair clinic, as they have the best team of professionals to take care of them. The clinic also charges only a nominal fee for all the treatments, which is very affordable for any common man compared to other clinics at Newcastle.